BACK IN MALACCA for a few days this week, hubby rummaged through his childhood stuff and found some “treasures” – hidden away but certainly not forgotten. They were, after all, proof of his younger, slimmer, athletic days – one upon a time 🙂 Majority were for swimming, a handful for discus and shot put. Each trophy holds special memories, some more than the others. 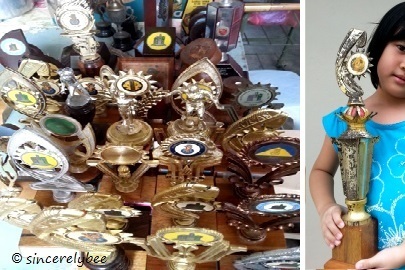 (L) Hubby’s treasured trophies; (R) Little Em holding her father’s tallest trophy. 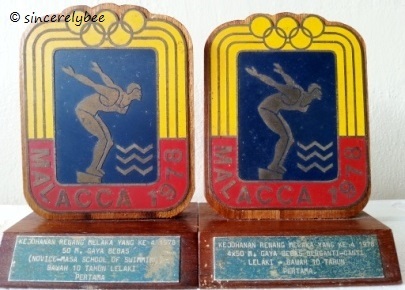 These were the first two trophies he won as a little boy (a fat one too, confessed hubby)… (L) Kejohanan Renang Melaka Ke-4 1978, 50m Gaya Bebas (Novice-MASA School of Swimming) Lelaki Bawah 10 tahun – PERTAMA; (R) 4X50m Gaya Bebas Berganti-ganti, Lelaki Bawah 10 tahun – PERTAMA. 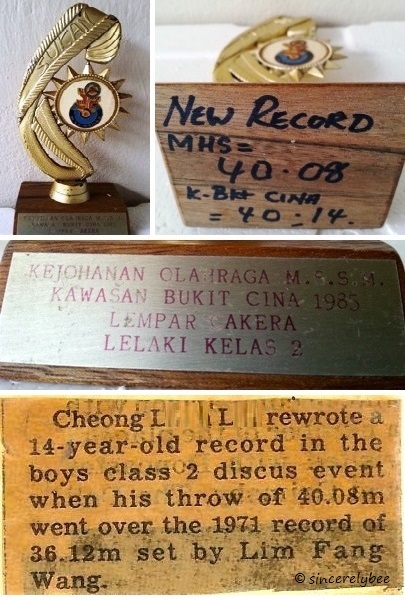 This simple-looking trophy was dear to him because he won it breaking a 14-year old record for discus, at the Kejohanan Olahraga M.S.S.M Kawasan Bukit Cina 1985, Lempar Cekera, Lelaki Kelas 2; an old newspaper cutting of his feat. From there on, he broke the school and state records at subsequent meets. 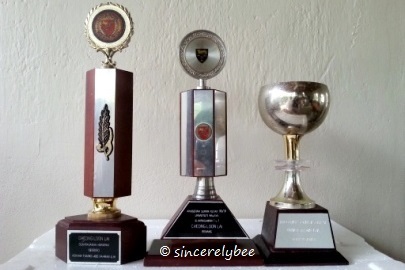 Treasured trophies from his varsity days… (L-R) Olahragawan Harapan 1989/90 awarded by Asrama Tuanku Abd. Rahman UM; Anugerah Sukan ASTAR 90/91 UM Olahragawan (L) Renang; Anugerah Sukan ASTAR 91 UM Olahragawan. This entry was posted in Happy at Home, School Days and tagged Home, School, University Malaya. Bookmark the permalink.